The Arctic LNG 2 project has made significant development progress since May 2018. Front-end engineering and design (“FEED”) work has been completed in October confirming the preliminary cost estimates between $20 billion and $21 billion. Moreover, additional exploration drilling confirmed significant reserve growth at the Project’s Utrenneye field, and accordingly, the Russian state reserves commission subsequently increased the field’s natural gas reserves to approximately two trillion cubic meters under the Russian reserves classification. Total consideration includes a payment for the 10% participation interest as well as financing for the Project through the capital of Arctic LNG 2. 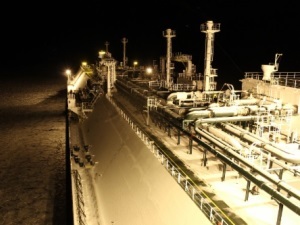 The Arctic LNG 2 project envisages constructing three LNG trains at 6.6 million tons per annum each, using gravity-based structure (GBS) platforms. The Project is based on the hydrocarbon resources of the Utrenneye field. As of 31 December 2018, the Utrenneye field’s 2P reserves under PRMS totaled 1,138 billion cubic meters of natural gas and 57 million tons of liquids. Under the Russian classification reserves totaled 1,978 billion cubic meters of natural gas and 105 million tons of liquids. Arctic LNG 2 owns an LNG export license.